Hello everyone, and welcome back to my page. I hope you all are well, and enjoying whatever format you are playing. There are many different ways to play sanctioned constructed Magic from EDH (the new Commander decks are coming out in about a week), Vintage, Legacy. Modern, and even Standard. However there are even other ways to play Magic, and honestly the longest running “format” is Casual. When Magic started nearly 25 years ago stores mainly sold the product, and people only played the game at their kitchen tables (often times in group games with friends). People played with the cards they had, and built on those over time. While the game has evolved greatly over the years there are still a plethora of people who play casually with their friends. One issue many players have had when playing Standard is when to get rid of cards that rotate out of Standard. Many of those who have this issue may only play at an FNM level type of play, which is perfectly fine. Honestly though we can actually keep those decks together, and then have some decks to play casually with against others. By doing so we can have decks whose power levels may vary depending on what your friends might have sleeved up. This will be an ongoing series that I will do once a month, or every other month, highlighting some of the decks I used to play in past Standards. The way these decks will be constructed will be using the full length of that meta (from the fall expansion, through to the summer expansion two years later), and cards banned in that Standard can not be used. Seems simple enough, right? Well let’s take a look at one of my all time favorite decks. 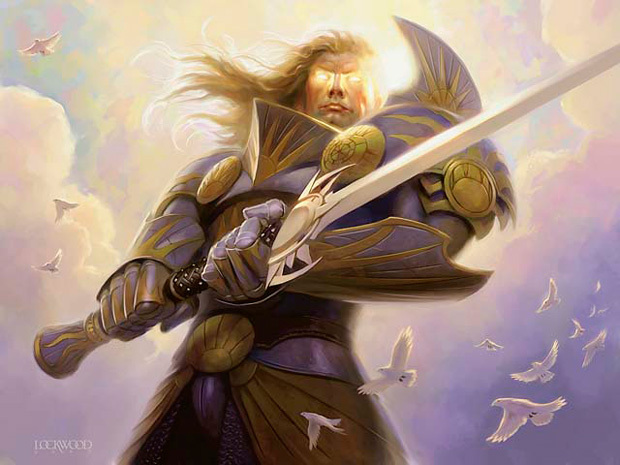 When Innistrad was release in the fall of 2011 Solar Flare was reborn. This deck (originally named during the time of Kamigawa/Ravnica Standard), takes a lot of the original strategy from the original version as well as being able to constantly recur some of your cards from your graveyard. The back bone of the deck are these three cards. With 2 Liliana of the Veil in your graveyard (or 1 on the field, and one in the graveyard) you can constantly recur her to have the opponent sacrifice a creature, or keep their hand empty. How it works is that early on you put Phantasmal Image into the graveyard (either through combat damage, or through the various ways to put the card there). Then you cast Sun Titan. When it enters the battlefield you can get a permanent of converted mana cost 3 or less back into play (even a land). Since the Image costs 2 (1U) to play it comes back. It then becomes a copy of the Titan, which the enter the battlefield effect triggers again (because the Image copies all traits of what it copies), and you can bring something different back (perhaps Liliana?). The deck also works like a tap out Esper Control deck with Lingering Souls, Gideon Jura, and Day of Judgment. Add in some card selection, and a few counterspells, and you can live long enough to implement your win conditions. There are times where you may lose a creature, or have to wipe the board. Unburial Rites helps correct that by bringing back your creature (usually Sun Titan), however there is one creature here that is a game changer: Elesh Norn, Grand Cenobite. Please welcome to the stage Lady Gaga! Against smaller decks this card could wipe your opponent’s forces away, and at the very least her anthem effect make your spirit tokens really efficient win conditions themselves. The sideboard focuses on countering opponent’s creatures permanently with Dissipate, protect yourself from graveyard hate (or other enchantments and artifacts that are problems), as well as some massive reanimation targets in Consecrated Sphinx, and Grave Titan. You may be wondering how this could be considered a “Casual” deck, but Casual does not necessarily have to mean cheap (or no rares, or whatever). Think of old Standard decks like this as ways to play a game when you and your friends want to play something besides board games, or living card games. This deck was a lot of fun when it was in Standard, and although it’s too slow for Modern (even with a manabase upgrade) it’s a solid fun deck to have when playing against friends. That’s what playing games should be all about anyway: fun. So why not maximize that? You never know when you are going to come across a new player at FNM who just wants to play, and your current Standard (or Modern) deck is not only overpowering, but also demoralizing to the opponent. Decks like this are also a good way of playing before other friends show up for your weekly board game or RPG night as well. That’s a look at a one of the decks I have for casual play. Did you play during the Scars of Mirrodin through Magic 2013 era? Is so what were your memories, or your favorite deck to play then? Please leave a comment below, and follow me on Twitter, and Facebook.